The March 2016 issue of Culture, Medicine & Psychiatry has recently debuted. Over the coming weeks, we will feature article highlights from a selection of the newest research published at our journal. To access the full issue, click here. This week’s article highlight examines Alex B. Nietzke’s piece “An Illness of Power: Gender and the Social Causes of Depression” (accessible here.) Nietzke argues that a mechanistic and biological model of depression overlooks the extent to which women across the world are frequently diagnosed with the disorder at a higher rate than men. When bioscience and biomedicine fail to attend to underlying social and gendered dimensions of depression as a diagnosis, the author holds, they are “silencing women” and “marginalizing” a discourse surrounding the problematic social power of the biomedical model. The article opens with a review of the literature on medicalization, which describes the shift from a psychodynamic model (where external factors were typically considered the source of reactive mental distress) to a biopsychiatric one (where, given the development of medications for mental disorders, mental illness was increasing viewed as seated within the patient’s biology.) The DSM-III later “eliminated” the categories for “reactive” mental illness, and placed physical symptoms (like weight loss) alongside psychological ones (like feelings of hopelessness) such that both expressions of illness were physiologically equated to one another. When biopsychiatry quiets the discussion of social determinants of mental illness, so too does it lend power to the systems of oppression that enable women’s suffering to continue, and limits their ability to express their psychological state. Put another way, by biologizing rather than contextualizing depression, women are inherently marginalized because they may have few other recourses outside of biomedicine for ameliorating the psychological ramifications of social disenfranchisement. The “silencing” Nietzke cues in the early paragraphs of the article returns here, as the author reminds readers that biomedicine’s biologizing of depression may problematically close the conversation around the social situatedness of women’s psychological experience and social status. The first 2016 issue of Culture, Medicine & Psychiatry has arrived! Over the coming weeks, we will feature article highlights from a selection of the newest research published at our journal. To access the full issue, click here. In this week’s blog, we visit Eaves, Nichter, and Ritenbaugh’s article “Ways of Hoping: Navigating the Paradox of Hope and Despair in Chronic Pain” (accessible here.) The authors carried out a series of qualitative interviews with patients experiencing temporomandibular disorders (TMDs) throughout a clinical trial where these patients received traditional Chinese medical treatments (TCM.) The authors’ research with 44 patients in the clinical trial highlight the paradoxical nature of hope: that is, a tendency to both place faith in the possible efficacy of a treatment, while cautiously gauging these expectations to avoid feelings of despair should treatment fail to produce a positive result. The authors argue that hope serves as a complex placebo, in that while not itself being an active pharmaceutical or other intervention, it can have significant implications for a patients’ course of care. Following a review of methodology and the theoretical basis of medical “hope,” the authors present a diverse array of examples from their interviews that illustrate the range of expectations, beliefs, and experiences of the chronic pain patients. For some patients, hope is secular: related to realistic treatment goals (such as a small reduction in overall pain), or to utopian ideas about the treatment’s future potential for other patients. For others, hope is an expression of spiritual faith, or a form of almost religious belief in the effectiveness of bioscientific breakthroughs, or even a belief that biomedicine has failed the patient and a remedy for their pain can only be found in other medical systems (like TCM.) Other patients described an embodied response to the treatment that, the authors comment, underscores the relationship between placebo and (psycho)somatic healing. In all these examples, however, what is perennially apparent is the patients’ tenuous balancing of hope with tempered expectations for a cure. However it comes to be framed, hope both enhances and complicates the treatment of chronic pain. In some cases, hope acts as a “positive” placebo in that it bolsters the patients’ faith or trust in the potential (or even observable) efficacy of the treatment. In other instances, hope can prove to be a harmful placebo in that it may promise beneficial change and render any failing of an experimental treatment more troubling for the patient. Because hope offers such conflicting possibilities for patients’ satisfaction and trust in a treatment modality, it is essential for both anthropologists and clinicians to consider the cultural, cognitive, embodied, and religious frameworks in which a patient conceptualizes and subsequently approaches treatment. Out this August 2015 from the University of California Press is Janis H. Jenkin’s Extraordinary Conditions: Culture and Experience in Mental Illness. This ethnographic text explores the lives of patients of diverse ethnic and cultural backgrounds experiencing trauma, depression, and psychosis, taking into account the identity, self, desires, gender, and cultural milieu of the participants. Jenkins’ text pays special attention to the reduction of the severely mentally ill to a subhuman status, and the nature of this social repression. Jenkins argues for a new, dynamic model of mental illness as a struggle rather than a constellation of discrete symptoms, noting that such a model should consider the ways that culture is implicated in mental illness experience from onset through recovery. 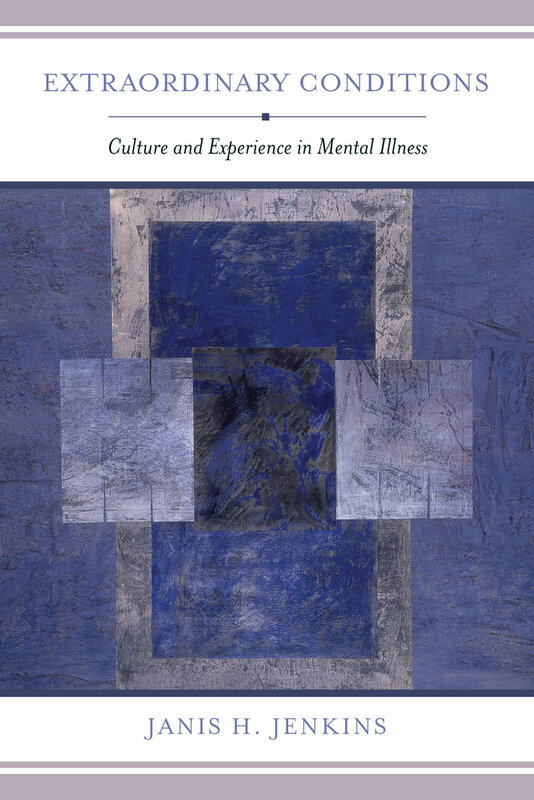 The book posits that inclusion of culture into the clinical practice of psychiatry is crucial to the successful treatment of patients, and that anthropologists must not only consider the normative, day-to-day lives of participants but also the “extraordinary” and uncommon conditions regularly faced by those with mental illness. This book will be of interest to psychological and psychiatric anthropologists, as well as those studying mental health care delivery systems. It will also shed light on medical narratives in mental health, and on generating new theories of human experience and medicalization.